Images of James T. Vaughn state correctional facility in Smyrna, Delaware, during a lockdown on Feb. 1, 2017. SMYRNA, Del. -- Police used a backhoe to breach a building at Delaware's largest prison early Thursday, ending what the governor called a "torturous" hostage standoff that left one guard dead. Inmates used "sharp instruments" to assume control of the building at the James T. Vaughn Correction Center on Wednesday, taking three prison guards and a woman counselor hostage. The inmates told a local newspaper that concerns about their treatment and the leadership of the United States had prompted their actions. Authorities did not say how Sgt. Steven Floyd died. He was a 16-year veteran with the prisons agency. During the standoff, inmates negotiated to have the water turned on, which authorities said the prisoners used to fill up small foot lockers to build a wall at the prison entryways. Delaware State Police entered the building about 5:05 a.m. Thursday and found Floyd unresponsive. He was pronounced dead about 25 minutes later. RAW VIDEO: SWAT team arrives at prison in Smyrna, Del. Action News is on the scene of a lockdown at the Delaware state prison in Smyrna. The counselor, a Department of Correction employee, was rescued. Delaware Department of Safety and Homeland Security Robert Coupe said some inmates had shielded her from harm. She is being examined at a hospital. Coupe described the inmates' weapons as "sharp instruments" but did not elaborate. "My prayers all day yesterday was that this event would end with a different result but it didn't," Gov. John Carney said. "So today all of us mourn for the family of Sgt. Floyd." The prison is in Smyrna, about 15 miles north of the state capital of Dover. The governor said the priority now is to determine what happened and why. In a statement released Thursday, the new Democratic governor said officials will "hold accountable anyone who was responsible" for taking the hostages. He said officials will "make whatever changes are necessary to ensure nothing like it ever happens again." It wasn't immediately clear whether any inmates had been held against their will. Coupe said all 120 inmates in the building were considered suspects while Department of Correction Commissioner Perry Phelps said dozens of inmates had been "released" during the standoff. The disturbance began about 10:30 a.m. Wednesday when a correctional officer inside Building C radioed for immediate assistance, Delaware State Police spokesman Sgt. Richard Bratz said. Other officers responded to help, and the employees were taken hostage, he said. A news release from the Delaware Department of Correction said 14 more inmates were released about 12:30 a.m. Thursday from the building where the hostages had been held and were being held elsewhere at the prison. The news release said a total of 46 inmates had been released from the building since the standoff began. 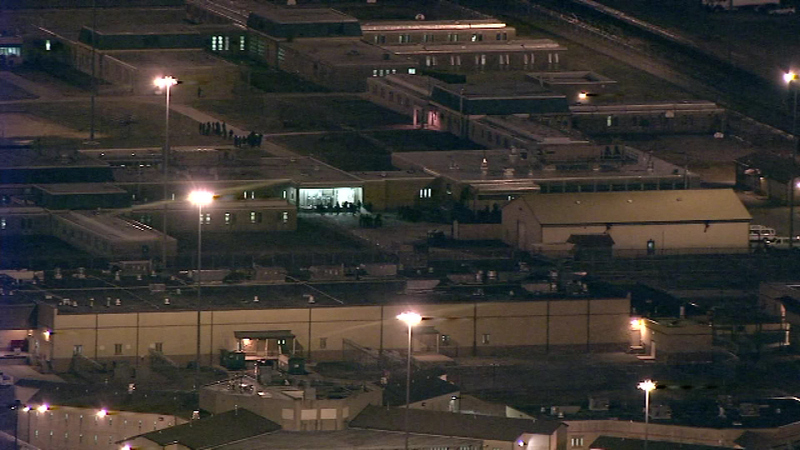 RAW VIDEO: Chopper 6 over prison hostage situation in Smyrna, Del. The hostage situation drew dozens of officers and law enforcement vehicles and prompted a statewide lockdown of all prisons. The first hostage was released Wednesday afternoon and another was released hours later. Both had injuries that are not life-threatening, authorities said. Three maintenance workers who had been hiding in the basement were able to make their way to the roof, where they were rescued, Phelps said. Earlier in the day, inmates reached out to The News Journal in Wilmington in two phone calls to explain their actions and make demands. Prisoners funneled the calls to the paper with the help of one inmate's fiancee and another person's mother. The mother told the paper that her son was among the hostages. In that call, an inmate said their reasons "for doing what we're doing" included "Donald Trump. Everything that he did. All the things that he's doing now. We know that the institution is going to change for the worse." That caller said education for prisoners was the inmates' priority. They also said they want effective rehabilitation for all prisoners and information about how money is allocated to prisons. According to the department's website, the prison is Delaware's largest correctional facility for men, with about 2,500 inmates. It houses minimum, medium and maximum security inmates, and also houses Kent County detainees awaiting trial. It employs 1,500 corrections officers, according to Bruce Rogers, counsel for the Correctional Officers Association of Delaware. In 2004, an inmate at the Smyrna prison raped a counselor and took her hostage for nearly seven hours, according to an Associated Press report at the time. A department sharpshooter later shot and killed 45-year-old Scott Miller, according to the report, ending the standoff. Associated Press writers Sarah Rankin in Richmond, Virginia, David Dishneau in Hagerstown, Maryland, and Sarah Brumfield in Washington, D.C., contributed to this report.